Why is everyone starting to skip breakfast all of a sudden? Everyone is talking about how skipping breakfast may help cleanse your body and burn fat. There is a divide between people choosing to skip breakfast for the many benefits it has such as cleansing your body and giving your more flexibility when it comes to calories in your afternoon meals. Before you start skipping breakfast considering the pros and cons of each approach is a must. Many people think that only fat people skip breakfast and to succeed in weight loss, never skip breakfast. Although when thinking of how to lose weight skipping breakfast comes to mind there are others who believe that the healthy breakfast is the way to go. Breakfast is the standstill most important meal of the day. However, people are starting to think about the benefits of skipping breakfast. What do you gain buy not eating breakfast? For people who don't skip breakfast you may want to reconsider after reading this column. 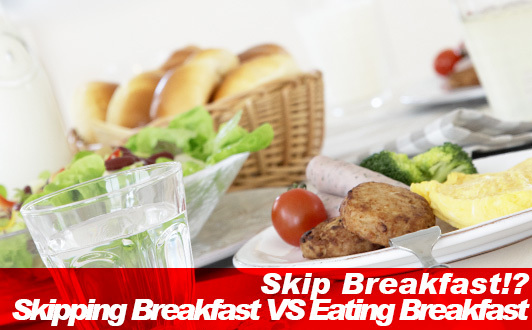 In this breakfast diet Slism, we will compare skipping breakfast with eating in the morning discussing the pros and cons your need to know before deciding whether or not to skip breakfast for yourself. Are you ready to skip breakfast? What is the skip breakfast diet? The skip breakfast diet is a diet where you don't eat breakfast accompanied by proper hydration. In the case you do require to have something for breakfast, you eat fruit or drink fruit juice. Like other breakfast diets such as the morning banana diet, morning kiwi diet, and the morning fruit diet, the skip breakfast diet is said to be just as effective for those trying to lose weight. Only looking at the skip breakfast diet in terms of calories, not eating breakfast seems like an easy way to cut back on calories in your diet. That's great, but before you start skipping breakfast just yet, here are the pros and cons of skipping breakfast and eating a hearty meal in the morning. It is said to take as much as 18 hours for your body to process the food you eat. Practitioners of the skip breakfast diet argue that eating 3 meals a day doesn't give your digestive system time to rest making it almost impossible to cleanse your body. Although it may not seem like that when you skip breakfast in the morning that the results is that you are less likely to suffer from lack of energy during the day, some believe there is more than enough energy left over from the previous day. By skipping breakfast you give your body a chance to burn fat left over in your body metabolizing fat into energy your body can use without eating breakfast. Better detox by skipping breakfast!? Reducing the number of times you eat a day is an effective approach to flushing the unwanted toxins in your body which otherwise would begin to accumulate in places like the lower extremities of your body such as your feet requiring special treatment. The brain is fueled by glucose. When you lack glucose in your blood it is said to become harder to concentrate and remember things affecting your brain power. As you sleep the amount of available glucose for your brain decreases gradually, leaving you most vulnerable to brain fog first thing in the morning. Eating breakfast helps cure brain fog giving your brain the glucose energy it needs to power up. Eating breakfast stimulates your stomach and intestines serving as an agent helping to improve bowel movements. People accustom to taking a bathroom break right after eating breakfast know this too well. Simply when you eat breakfast you can prevent constipation naturally. As you sleep your body temperature drops potentially affecting circulation in your body. The best way to restore your core body temperature is eating and exercises in the morning. For people with low body temperature suffering the affect poor circulation on your ability to lose weight, having a low body temperature doesn't help you when it comes to burning fat. It may be in your best interest to fix low body temperature before taking diet and exercise to the next level. Although reducing the amount of calories you put in your body during your evening meals is said to be more favorable, due to the fact that you are more likely to spend time with family and friends eating dinner, eating less for dinner tends to be harder than you think. On the other hand, morning may be the best time to think about reducing calories in your diet. Skipping breakfast or holding back on the amount of calories you put in your body in the morning gives you flexibility to eat what you want after breakfast. Skipping breakfast may be just what you've been looking for if what you eat is beginning to build up stress day by day. Although the skip breakfast diet sounds like no eating, you can get away with eating fruit or drinking a glass of fresh fruit juice while still staying within the rules. Being able to eat what you want for lunch and dinner not having to worry about the stress associated with eating too much is where skipping breakfast leads to less stress making you more likely to succeed in your diet. Skipping breakfast leaving you hungry approaching lunch may have dire consequences that you don't want to have to face when on a diet. The biggest con of not eating a meal has to do with balance. Less balance in your diet tends to lead to overeating. Not eating breakfast in the morning can lead you to overeat fast which quickly raises your blood sugar level causing the level of the hormone insulin in your body to raise causing excess amounts of fat to be stored away in your body. Eating more often in fewer amounts is said to result in a more stable blood sugar level, which in turn keeps your insulin levels down reducing unnecessary storage of fat. There are many pros and cons to consider when trying deciding which is better, skipping breakfast or eating a hearty breakfast for weight loss. For people trying too hard to eat breakfast just going with the motions and relieving stress eating more than you should for dinner, skipping breakfast or simply having fruit in the morning may be just what you need to get your diet back on the right track. On the other hand, cutting back on calories shouldn't be the only reason to skip breakfast in the morning. If you find yourself being too full to do anything after eating breakfast, then balancing out the food you eat into more meals is recommended. Whether you chose to eat breakfast like everyone else or adventure into skipping breakfast always keep in mind that balance in your diet is the key to eating healthy not to mention losing weight eating right. Are you worried that if you skip breakfast, you will get fat? Discover how you can turn this habit into an essential part of your diet. There is hope that this too can work for you.